Birmingham, located in the centre of the West Midlands region of England, is the second largest city and a major manufacturing centre of the UK. It is also an international metropolis with over 1,000,000 residents and one of the most concentrated industrial parks in the world. As early as in late 19th century, Birmingham started building a connection with China. In recent years, it has engaged in the active and fruitful cooperation with China in various fields. 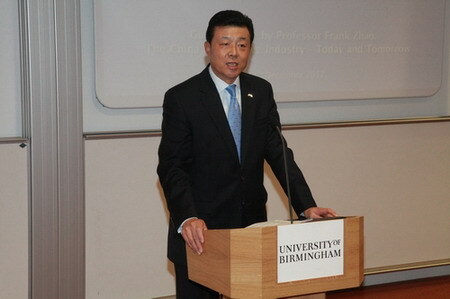 On December 13-14, shortly after the 18th CPC National Congress was ended and at a time when the Birmingham City Council elected a new leader, Ambassador Liu Xiaoming made his second visit to Birmingham, in order to sustain and promote the active cooperation between China and Birmingham in different fields such as politics, economy, trade, education, science and culture. 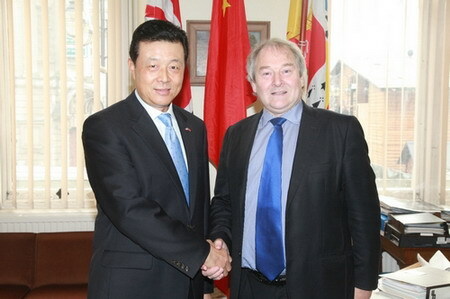 In the afternoon, Ambassador Liu also met with Mike Whitby the opposition Conservative leader of Birmingham City Council. Ambassador Liu said, “When making new friends, we Chinese people will not forget the old ones. Over the past few years, you made a very positive contribution to the friendly relations and cooperation between China and Birmingham. 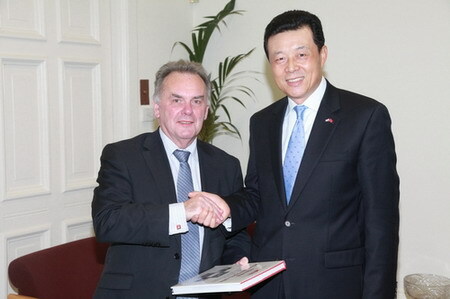 Now, as you take the position of the opposition leader of Birmingham City Council, we hope you will continue to give attention and support to the development of the China-UK relations.” Mr. Whitby thanked Ambassador Liu for making this trip to visit him and said he would continue to attach great importance and commit to promoting mutually beneficial and pragmatic cooperation between Birmingham and the relevant Chinese provinces and cities, businesses and universities, and at the same time, he would do his best to promote increased mutual understanding between the two sides and to help them handle their differences properly, in order to achieve continuous development of the friendly relations between the two countries. 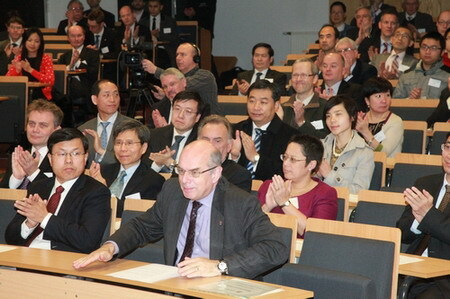 Similarly, business leaders in Birmingham had also been looking forward to the arrival of Ambassador Liu. What kind of new business opportunities will the 18th CPC National Congress create for them? What new developments are expected for their respective fields? They wanted to get an authoritative answer from the Chinese Ambassador. 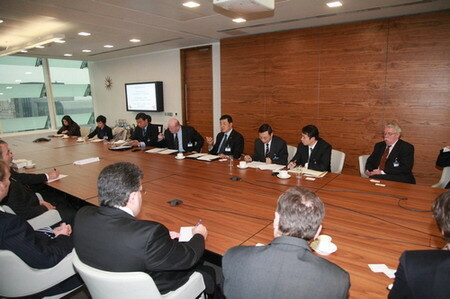 For this reason, on the morning of December 14, a seminar between Ambassador Liu Xiaoming and the local business elite was held at the office building of KPMG in Birmingham. Early that day, over 20 business leaders in Birmingham arrived at the seminar, including Mr. Paul Noon, Regional Director for UK Trade & Investment West Midlands, Mr. Steve Brittan, President of Birmingham Chamber of Commerce, Mr. Jonathan Webber, Director of International Trade and Development of Birmingham Chamber of Commerce, and Mr. Mike Steventon, Senior Partner of KPMG in Birmingham. Ambassador Liu delivered a keynote speech at the seminar. He focused on the four opportunities that the 18th National Congress of the Communist Party of China brought to the China-UK economic and trade cooperation, especially to the cooperation between China and Birmingham. “First, the 18th CPC National Congress Report stated that China would promote all-round improvements to China’s open economy. To achieve this goal, we need to meet two requirements: first, equal emphasis should be placed on both exports and imports, which means that China will continue to expand exports and at the same time increase imports; second, China will expand foreign investment and the Chinese enterprises will expand their overseas presence at a faster pace. In the first three quarters of this year, the West Midlands region which includes Birmingham has a trade surplus with China. This indicates that there is great potential for Birmingham to expand exports to China. 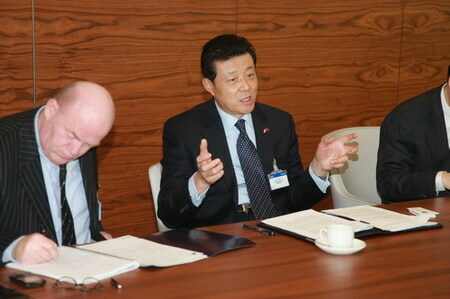 Besides, there are also a lot of successful stories in attracting Chinese enterprises to invest in Birmingham. I believe with the increased investment of the Chinese enterprises in the UK, there will be more projects settled into Birmingham in the future. Second, the 18th CPC National Congress proposed that China would promote integration of IT application and industrialization. In other words, China will enhance the industrial economy and the core competitiveness of enterprises through information technology and grow advanced manufacturing. IT application is a complicated systematic process covering management, standards, data, and software, etc. Many enterprises in Birmingham are sophisticated and experienced in the above-mentioned fields, so they have great potential in developing cooperative relations with the Chinese enterprises. Third, the 18th CPC National Congress clearly stated that China would speed up the transformation and upgrading of traditional industries and develop and expand the service sector, especially modern service industries. Birmingham has the advantage of being a convention and exhibition centre of the UK; actually, the National Exhibition Centre is located here. So, by virtue of this, Birmingham will be able to develop cooperation with China in this key area in the future. On one hand, it may attract more exhibitors from China to Birmingham for exhibitions; on the other hand, it may also promote the development of Chinese exhibition businesses based on this cooperation. Fourth, the 18th CPC National Congress proposed that China would support the development of small and micro businesses, especially small and micro science and technology companies. The West Midlands region, including Birmingham, is home to small and medium-sized companies, and many of them have unique and cutting-edge technology. The cooperation between China and the UK in the fields of technology and investment should not be confined to large enterprises and projects. In effect, the extensive project cooperation between small and medium-sized companies may create greater benefits and promote employment.” The entrepreneurs were greatly inspired by Ambassador Liu’s speech and they seized the opportunity to have a deeper discussion with Ambassador Liu. Mr. Steve Brittan, President of Birmingham Chamber of Commerce, wanted to learn about the reform of China’s state-owned enterprises. Ambassador Liu introduced the general plan of the reform, saying that while adhering to the dominant position of public ownership in the economy, China would continue to encourage and support the common development of economic entities of diverse ownership. Another question was “Against the backdrop of China’s sustainable development campaign, what new developments are expected for the energy and transportation industries in the future?” Ambassador Liu introduced the use of solar, nuclear and other renewable energies in China. He said that the Chinese government had pledged to reduce energy intensity per unit of GDP by 16 percent of its 2010 level during the 12th Five-Year Plan period (2011-2015). China is willing to increase technical cooperation with other countries in the fields of wastewater treatment and carbon capture to jointly improve energy conservation and environmental protection. Ambassador Liu also answered some other questions about how to attract investment from China, the process for foreign merger and acquisition in China, IPR protection in China, and Chinese talent development. During his trip to Birmingham, Ambassador Liu also paid a special visit to the University of Birmingham, a distinguished British red brick university and a member of the Russell Group which represents 24 leading universities in the UK. On the afternoon of December 13, in front of the Vice-Chancellor’s office building, the main campus of Birmingham University, stood the tallest freestanding block tower of the world. It was toward the evening, silhouetted against the deep-blue sky, the block tower looked even more majestic. 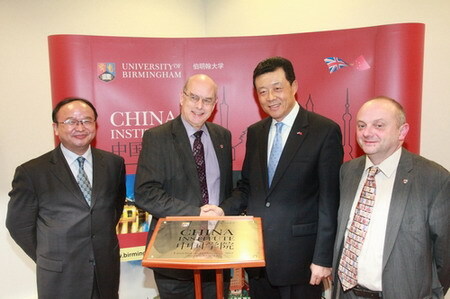 Based on its successful cooperation with China in the past few years, Birmingham University formally established the China Institute this year. Ambassador Liu was invited to attend the opening ceremony of the Institute and delivered s speech. Nearly 200 people, including Mr. David Eastwood, Vice-Chancellor of the University of Birmingham, and other scholars, professors, and students from this university attended the ceremony. 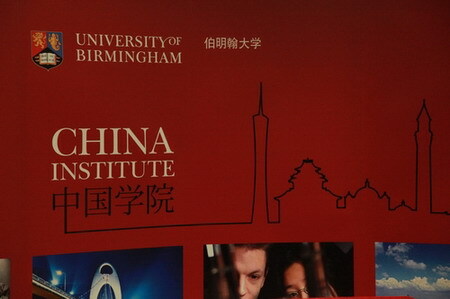 Ambassador Liu first expressed his warm congratulations on the opening of the China Institute of Birmingham University. Then in retrospect of the more than 100 years of exchanges between China and Birmingham University, Ambassador Liu praised it as one of the British universities that have the most successful educational exchanges and cooperation with China. Ambassador Liu also made some suggestions on how to develop the China Institute into one of the first-class centres for China Studies in the UK. Subsequently, Ambassador Liu and Vice-Chancellor David Eastwood, with a warm round of applause of the audience, came to the front of the new bronze plaque inscribed with the “China Institute” next to the podium, and jointly inaugurated the Institute. After the ceremony, Ambassador Liu visited the Birmingham Centre for Railway Research and Education and its laboratory. He learned about the research and development of the Centre in the fields of railway track technology, aerodynamics, railroad track safety and rail safety control, as well as its cooperation with China. As the lab director introduced, this laboratory is the largest railway research group in Europe. It has 45 doctoral candidates and one-third of them are from China. The Centre has established cooperative relationship with Beijing, Anhui, Guangzhou and other provinces and cities. It hopes to be more involved in China’s railway construction and transportation services. Ambassador Liu asked with great interest about the details of cooperation between the two sides and said that the Chinese Embassy would be willing to provide support and assistance for the cooperation between the two sides. While in Birmingham, Ambassador Liu also visited the Birmingham Royal Ballet. The world-renowned Ballet, commonly known as “Royal Ballet 2”, moved from London to Birmingham in 1990. It adheres to the traditional British ballet style and has its own characteristics. It has been to China on several occasions for performance. Ambassador Liu exchanged views with Byron Allen, CEO of Birmingham Royal Ballet, and Michael Clarke, Chairman of Birmingham Royal Ballet, on their cultural and art exchanges with China. Accompanied by them, Ambassador Liu watched the rehearsal of the new ballet “Aladdin” and met with the Chinese Principal Dancer of the Ballet.